The assuring words of the state police chief and the mayor that criminal activities in Ipoh have nose-dived sound a little far-fetched. At the last city council full-board meeting the mayor went on record to say that since the installation of closed-circuit television cameras at crime-prone areas in the city, the crime rate had dwindled by almost 50 per cent. The comparison was made over a period of a year since the cameras were installed in 2010. The number of cameras is relatively small thus the area covered is limited. You can see the gadgets at the round-about near the MB’s residence, the garden behind the MBI building and at the Polo Ground. Monitoring is done 24 hours a day by a team of council staff in a purpose-built room within the MBI complex. The operator can zoom in and out of a target by a click of a mouse. Car thefts and bag snatchings are common, especially at Polo Ground. 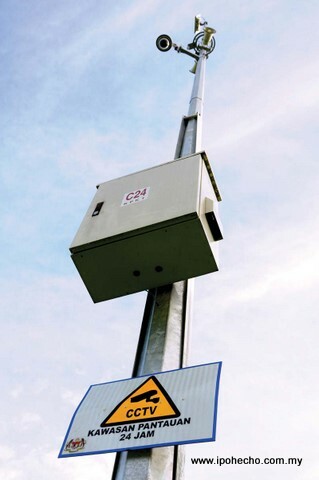 Catching those while in the act of committing a crime is possible with the use of these cameras. Recordings of their improprieties can also be obtained should criminal charges be preferred. The council has also embarked on a project to enhance safety by building railings to separate pedestrians and motorcyclists. This is to prevent bag snatching from happening. 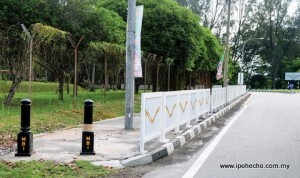 One can see these railings at the Polo Ground, in Taman Cempaka and along the road fronting Stadium Perak. When the railings were first installed, motorists coming out of the stadium area onto the road complained that their view was blocked. So the council had some replaced with bollards. This short-sightedness is not only baffling but costly. Money for installing railings, mirrors, bollards and lighting incidentally comes from a RM1.5 million allocation from the Home Ministry. On the issue of safety, the major grouse among Ipohites today is break-ins. No place seems to be safe now. My neighbourhood in Taman Tasek, Bercham is under siege, so to speak. The thieves are getting bolder by the day. One morning, I found a wooden ladder leaning snugly on my rear gate. I thought nothing of it until my wife came with a most unlikely story. She said that the palatial corner house was broken into during the night and some jewellery and cash were missing. The thief (or thieves) had scaled the wall and got into the house through the ceiling. The innocuous-looking ladder could be their tool. Soon the ladder became an object of conversation and many flocked to my backyard to have a look at it. We like to assume that thieves are opportunists who will wait for the right moment to strike. If this is your assumption, think again. My next-door neighbour’s house was assailed by a lone crook who sneaked into the house while they were watching the 8.00 p.m. news. He bolted when the son went to the kitchen to get some drinking water. Another lost his wallet with RM1,000 cash in it and his handphone. The thief fished the items from his room when he was fast asleep. His bedroom windows were open. Someone suggested forming a neighbourhood watch or Rukun Tetangga, like they did in the 70s. But when most are out eking a living, creating one is simply impossible. Engaging a security company to stand guard is desirous, but how many are prepared to contribute? The responsibility, therefore, lies with the Police to safeguard the people. But how are they to perform when their resources are over-stretched? The Sungai Senam police station has only about 50 personnel and its area of responsibility covers Polo Ground, the stadiums, Fair Park and Canning Garden. Over 100,000 people reside in these areas alone. How is this motley band of officers going to keep crime in check? So the next time the police chief and the mayor say that crime rates in Ipoh have gone down by a few notches, take it with a pinch of salt.